This soulful melody has a rich background involving a Chechen tribe leader named Shamil. A story is told of a man named Shamil, a leader of assorted tribes that lived in Russia’s Caucasian Mountains over a century ago. The Russian army attacked these tribes, intending to deprive them of their freedom. Unable to vanquish the valiant warriors in battle, the Russian army leaders proposed a false peace treaty, and thus succeeded in getting them to lay down their arms. Immediately afterwards, the Russians lured the Caucasian leader, Shamil, away from his stronghold and imprisoned him. Staring out of the window of his small narrow cell, Shamil reflected on his days of liberty in the past, In his current exile and helplessness, he bewailed his plight and yearned for his previous position of freedom and fortune. He consoled himself, however, with the knowledge that he would eventually be released from his imprisonment and return to his previous position with even more power and glory. It is the above thought that he expressed in this melancholy, yearning melody. The Moral: The soul descends to this world from the heavens above, clothed in the earthly body of a human being. The soul's physical vestments here are really its prison cell, for it constantly longs for spiritual, heavenly fulfillments. The soul strives to free itself from the "exile" of the human body and its earthly pleasures by directing its physical being into the illuminated and living paths of Torah and Mitzvot. The Rebbe was born near Nikolayev, which was the site of a number of vicious pogroms organized or tolerated by the Tsar. Imam Shamil was an Aver Muslim Sufi, of the Naqshbandi order. The Caucasus was victimized by a series of vicious Tsarist progroms, enslavements, ethnic cleansing. Shamil was kept captive in Russia and died in exile, on the Hajj. Shamil was caucasian. I don't know who felt a need to state that Shamil was not Georgian when we never believed he was Georgian. The Rebbe said he was from the kavkazi mountains, without mentioning which tribe he was from, but Daghestan is a Caucasian tribe. The song that we sing is based on something he sang. IMHO his motivation may have been different or his people recorded one part of the memory through the years while we held on to parts they didn't want to remember. Either way, the story is only a way for us to reach to something higher. 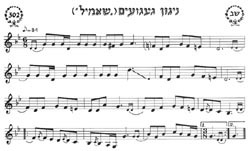 The main point is the way the Rebbe interpreted this song for the parable of the soul's yearning. reply: Shamil isn't a georgian Its sad that we have made so many mistakes in preserving a story that belongs to you. However this song is also a part of our history to some extent and no self-respecting chassid would deny the origin of the song (thoug how much of its history was told by the Rebbe [our religious leader, whose story must have been accurate] and how much was invented by his chassidim [followers, who may have been mistaken] is an important consideration that I'm unsure of). Is it possible that he sang this song after victories, but when in prison remembered it with regret that he could no longer have these victories? If I recall our version of the story correctly, a chassid passed by his window and heard it (though I'm pretty sure that he didn't ask him his intentions). i assure you of one thing though it IS muslims who have truley hatboured hatred towards the jews and NOT the other way around. also jews never really lived peacefully in muslim country's. To Anonymous in Jerusalem As a Jew, I think it is more often that media in Israel and the US tends to portray Muslims as evil terrorists and so on. I have lived in a Muslim country and I experienced less anti-Semitism than the amount of anti-Muslim sentiment I have seen in the West. Shamil is not Gerogian Please do not write your own imaginary version of well known history. Because it's part of my history, and I react when someboty changes it. Shamil wasn`n leader of a Georgian tribe but he was a leader of the Daghestan tribes in the North Caucasian (Russia). He was muslim and sufi and fought with Russia during 30 years.